The evening began with 49 Hall of Famers parading from the outfield to their respective positions as the crowd roared. The All Star starters then joined those Hall of Famers at their positions one by one as they were introduced to the New York crowd. As a Red Sox fan, I value Fenway much more than Yankee Stadium, but I cannot say that Yankee Stadium is not a magnificent ballpark. The third oldest ballpark in baseball, it is the House That Ruth Built and has been the home for as many memorable moments as any place in history. From boxing to football to the New York Yankees themselves, Yankee Stadium has been a cathedral for sports. With only half a season remaining in this amazing place’s life, it is only right that it hosted the 2008 All Star Game. It is only right that the greatest collection of players ever assembled in one place at the same time, was assembled in Yankee Stadium during its final year. And it is only right that the 2008 All Star Game was the longest All Star Game in baseball history as the Stadium became home to yet another instant classic. The night was already off to a fantastic start and the game would not disappoint. AL starting pitcher Cliff Lee and NLstarting pitcher Ben Sheets both pitched two scoreless innings withthree strike outs each to begin the game. This was just the beginning of the offensive struggles for bothsides. The National League scored single runs in the fifth, sixth, and eight innings. However, the AL came back. They tied the score 2-2 on MVP J.D. Drew’s two run homer in the seventh and then tied the game back up 3-3 on Evan Longoria’sdouble in the eighth. This is where the fun began. 14 combined pitchers had been used by both sides through the first eight innings. This is not abnormal for an All Star game, but had either manager known the game was going to go 15 innings, I’m sure they would have managed differently. Entering the ninth, the AL and NL both hadfive remaining pitchers, but both squads had one pitcher who was not supposed to throw. For the American League, Tampa Bay Rays’ starter Scott Kazmir had thrown 104 pitches on Sunday and the Rays had stated adamantly that they did not want Kazmir pitchingin the game. The Arizona Diamondbacks said the same about Brandon Webb who through 107 pitches last Sunday. In the top of the ninth with a man on first and one-out, the AL successfully completed a strike ’em out, throw ’em out double play. Now in the top of the tenth, the National League had another opportunity to score. With men on first and third and one out, Florida Marlins’ second baseman Dan Uggla stepped to the plate and grounded into a double play, killing the NL’s chance. This would be the first of many awful plays by Uggla in what turned out to be the worst All Star performance ever. The American League finally got a chance in the bottom of the 10th, mainly thanks to Uggla. The Marlins’ second baseman committed two errors on consecutive plays to give the AL first and third with no one out. However, Colorado Rockies’ pitcher Aaron Cook kept calm and after an intentionalwalkto load the bases, got the next two batters to ground out weakly, allowing his infielders to get the runner at home both times. Justin Morneaustepped to the plate with two outs and the bases still loaded and hit a slow grounder to shortstop Miguel Tejada, who grabbed the ball and fired mid-air to first to get Morneau by a half-step at first base and keep the game going. It was a fantastic play by Tejeda, who had an excellent game overall. Tejada’s defensive play was outdone in the bottom of the 11th inning though when Pittsburgh Pirates’ center fielder Nate McLouth threw out Dioner Navarro at home plate after he tried to score from second on a single by Michael Young. On to the 12th where the NL had yet another great opportunity which was only to be thwarted once again by guess who? Dan Uggla. With the bases loaded and one out, the NL only needed a sacrifice fly to take the lead, but Uggla struck out on three pitches. Adrian Gonzalaez then struck out swinging to end the threat. The pitchers may have buckled down and thrown some good pitches when they really needed them, but both sides squandered countless opportunities which is why this game dragged on to after one in the morning. After a few more uneventful innings (except for Uggla who committed his third error of the game, an All Star record), the AL finally finished off this marathon game. With the bases loaded and one out, Michael Young lofted a weak fly ball to right field. Justin Morneau tagged from third and b arely beat the throw home to give the American League a 4-3 victory. It was only fitting for a game which was full of incompetent hitting to end on a shallow pop up. It just goes to show that good pitching always beats good hitting and if any GM is trying to build a Championship caliber team around hitting (aka the Texas Rangers), they better rethink their ideas. Dan Uggla finished the night 0 for 3 with three errors, two strike outs, and grounded into a key double play. 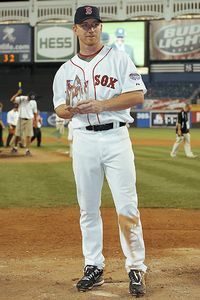 Meanwhile, MVP J.D. Drew went 2 for 4 with a double and the two run homer. Oh yeah, remember how Brandon Webb and Scott Kazmir weren’t supposedto pitch? Well the both pitched an inning and both managers were getting ready to start sending in some position players to pitch. AL manager Terry Francona’s reaction to the winning run crossing the plate was priceless as he jumped into fellow manager Jim Leyland’sarms. I was disjointed in the Yankee fans though as the stadium was less than half full by the end of the game. Maybe if you are at home you go to sleep, but if you are the All Star game and it is tied in extra winnings, why would anyone leave? I cannot understand how any baseball fan would leave during that game. I was on the edge of my seat for most of it as each offense blew chance after chance. 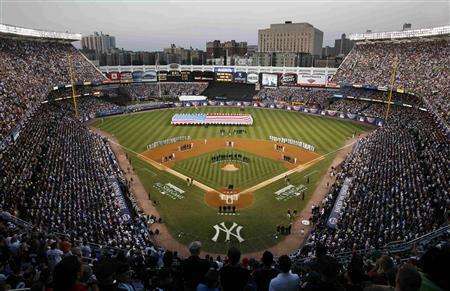 It was the best All Star game I have seen in any sport and was a perfect way to send off Yankee Stadium. Next ›Does Money Ball Work?